An important aspect of life that is often taken for granted is communication. Nowadays, in our society, we talk too much about nothing. (And our complaints...Why, that could be a separate blog post!) Rarely do I see conversations that involve a deep exchange of words. Perhaps that's because of the setting that I'm always in; which is high school. But even then, I feel like high school is the prime time to think about the more paragraphical answers to life's questions. At this time, our brains are still developing and with meaningful conversations, it will only increase our growth. Partially, I feel like people are too judgmental. In many instances, I've seen students shorten the length of their answers during class discussions because they want to use up the least amount of air time as possible due to the fear of judgement. And it's clear when that is the case because you can see the critical looks between students when someone might be taking a more extensive route on explaining their answers. There should be no shame in explaining yourself thoroughly! I also believe that society has subconsciously forced us to make everything we do concise and to the point. There's always a shortcut. There's always some way that will get you the most success in the least amount of time. There is always going to be the more efficient way. And maybe that's a good thing in some circumstances. But I do not think that vital human connection should be the shortened version that you take. Today, someone said to me something along the lines of "just go talk to him. If you have all the cheat codes to the game, then what's the point?" And I really took that to heart. There are no cheat codes to simple communication. If you want to talk to someone, then just do it. 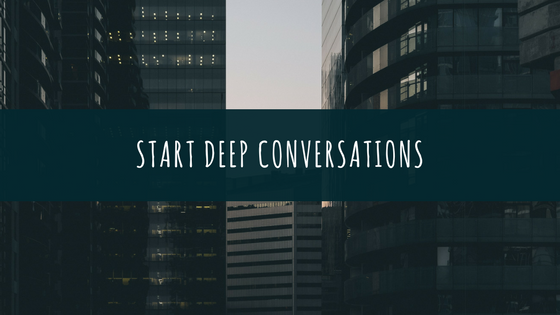 Don't prepare with conversation starters found online or try to find information about them beforehand. (I'm guilty of both.) Even though communicating is so artificial nowadays, we can try to change that.